The pic shows how different sports exert site specific effects on the bone mineral density of the skeleton. 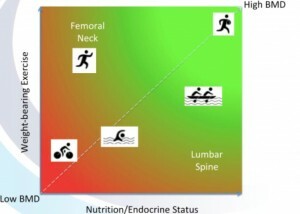 In general terms, hip femoral neck BMD is more dependent on mechanical loading osteogenic stimuli, whereas lumbar spine BMD is more dependent on nutritional and Endocrine status. What are the most effective mechanical osteogenic stimuli? Evidence from animal models demonstrates that bone responds to exercise that is dynamic, non-repetitive and unpredictable. Load and repetitions are not such important factors. This is shown in a study of track and field athletes, where sprinters were found to have higher BMD at load bearing sites of the skeleton than long distance runners due to a local loading effect rather than a systemic effect associated with repetitive loading nature of longer distance running. The other important consideration is that sprinters and rugby players tend to weigh more with higher lean mass than distance runners, providing higher skeletal loading forces. These differences in anthropometric and body composition metrics are also associated with different nutritional and Endocrine status. Swimming and cycling are similar in that both these types of exercise do not provide mechanical skeletal loading osteogenic stimulus. Skeletal loading exercises for cyclists would have to be effective and practical, not requiring access to gym and possible to fit into training schedule throughout the season.